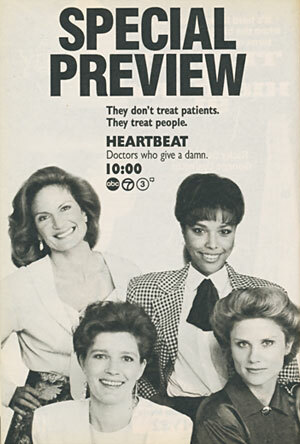 Heartbeat, a sophisticated, intelligent drama about a medical clinic that's owned and operated by women, returns for a second season that producer/writer Joe Viola (formely of Cagney & Lacey) promises will consistently "address tough issues." Tonight, Joanne (Kate Mulgrew) wrestles with her conscience when she decides to fight an old friend's malpractice suit and Eve (Laura Johnson) is caught in a moral dilemma when she bristles at a prostitute's request for an abortion. Return: The Women's Medical Arts Clinic hangs out its shingle for a second season as Joanne (Kate Mulgrew) is caught in the middle when her friend's malpractice suit puts the clinic in financial jeopardy, while Eve and Cory (Laura Johnson, Lynn Whitfield) agree to take on a pro bono case. Leo: Ben Masters, Paul: Darrell Larson, Marilyn: Gail Strickland.